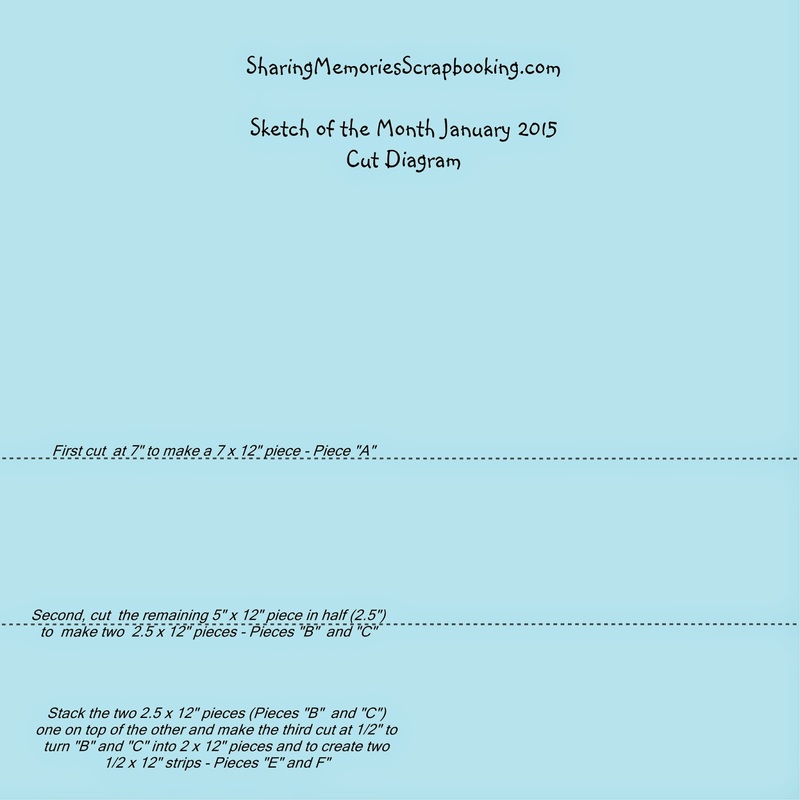 Make your first cut across the page at 7 inches to give you a 7 x 12 piece. This will be piece "A". Set aside. 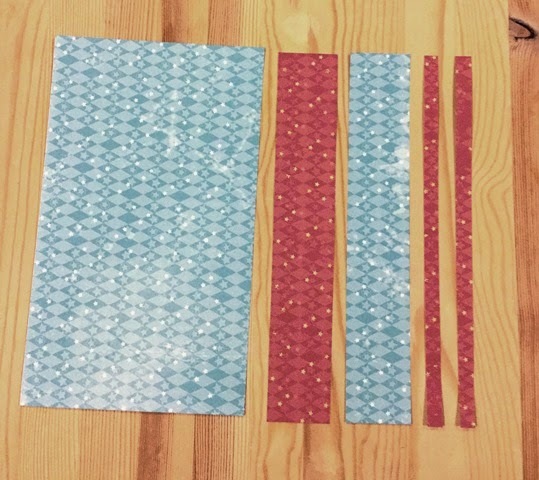 Your second cut will divide the remaining 5 x 12 piece of paper into two 2.5 x 12 pieces. Finally, stack the two 2.5 x 12 pieces and cut through both at 1/2". The two 2 x 12 pieces are pieces "B" and "C", and the two small 1/2 x 12 pieces will be "D" and E". Flip pieces "B", "D" and "E" pieces over to the opposite side. 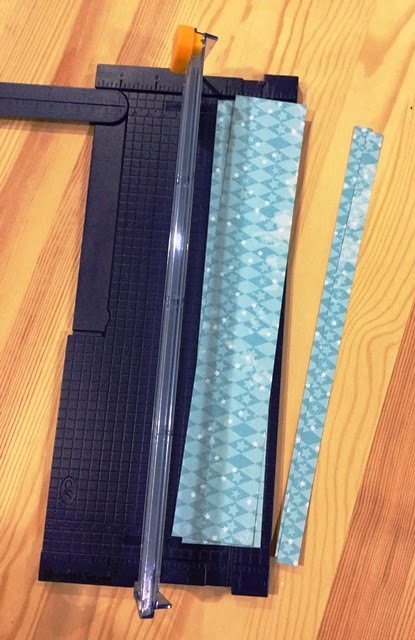 This will give you all 5 pieces of paper needed for the layout. Now assemble your layout following the sketch. The three vertical 4 x 6 photos are mounted on the 7 x 12" piece and then bordered by the two 1/2 x 12" strips. 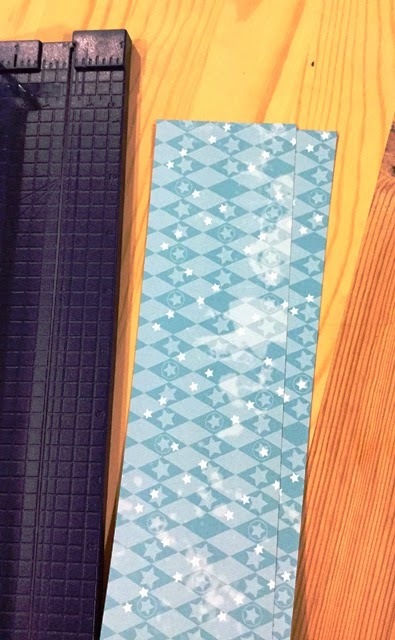 Note that I made the two 2 x 12' strips into pennant strips by cutting a triangular piece from each - and adding those pieces to the first page of the layout as shown. (Oops...I guess this technically makes 5 cuts all together, sorry! Well, we'll pretend that minor scissor cuts don't count - wink!) 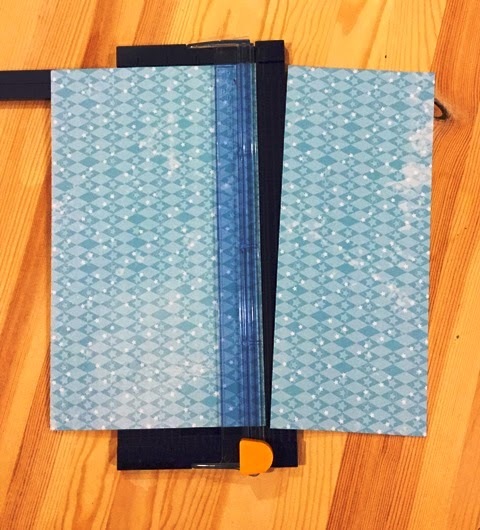 Finally, add your journaling, a title and/or embellishments. I used four die cut embellishments that came in the stack pack with the paper, one of which serves as the title. 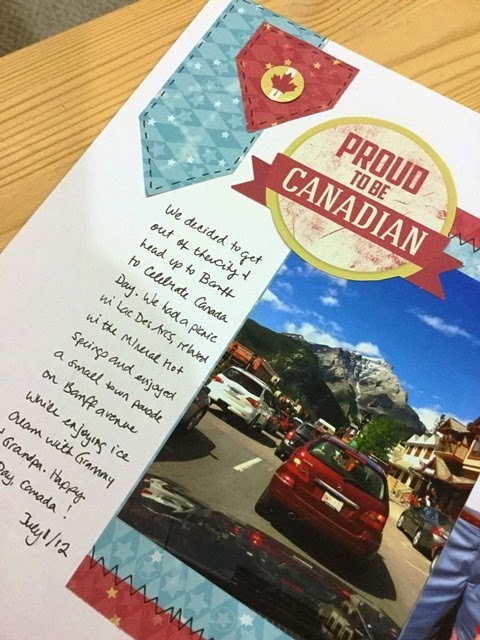 The photos were taken up in Banff on Canada Day 2012 and I used paper and die cuts from the "Freedom" kit by Creative Memories, which was released only a short time before they went under in 2013. 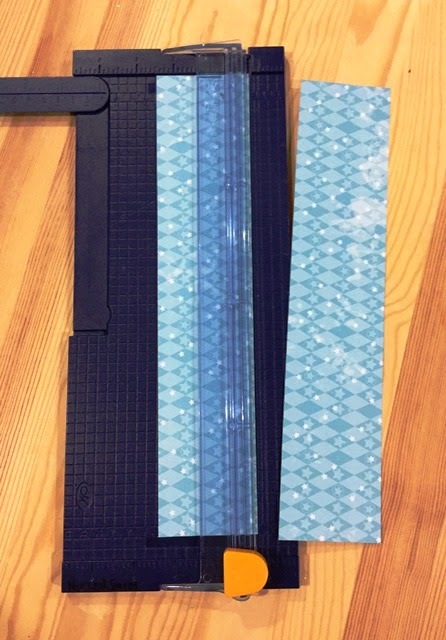 I see that the new Creative Memories has just released some new papers, albums, slide in cards and custom cutting system blades! 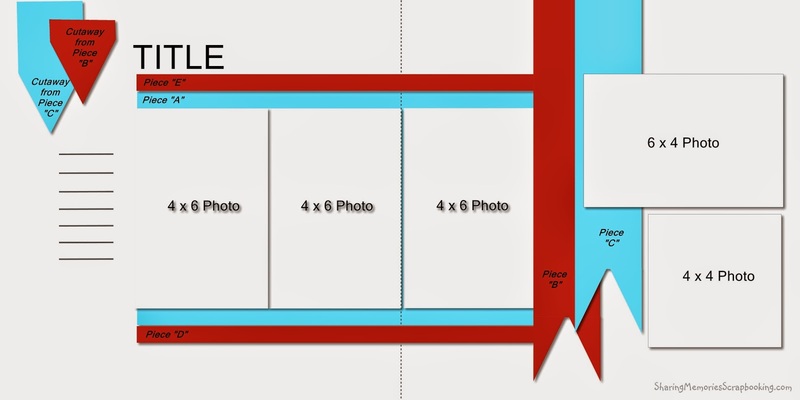 And, cardstock packs, and a revamped corner rounder and photo trimmer are all set to be released soon! I can't wait for my province to give the green light for CM to sell here...I'll be signing up as an advisor as soon as that happens! And you should definitely take a moment to check out this sweet CM video...their renewed mission statement reminds me why I love scrapbooking and helping people preserve their memories and share their stories! I hope you like the sketch and that you give this 1-2-3 formula a try. Leave a comment or link below if you do...I'd love to hear what you think and see what you create!